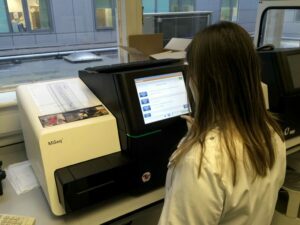 We provide bespoke sequencing and bioinformatic analysis to biomedical research scientists throughout Wales. High-throughput (Next Generation) sequencing is a new, rapidly developing technology, of fundamental importance to modern genetics research in general and biomedical research in particular. 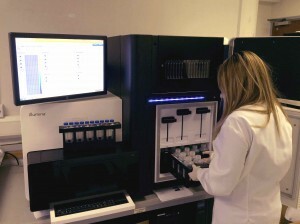 Illumina HiSeq 2500 – A production-scale genome, exome and transcriptome sequencing platform. We provide high-throughput sequencing technology for genetic research in Wales and provide expert support and advice to encourage greater uptake of this fundamental technology. We are supporting development of sequencing for diagnosis of inherited and acquired disease, enabling more personalised and effective treatment. 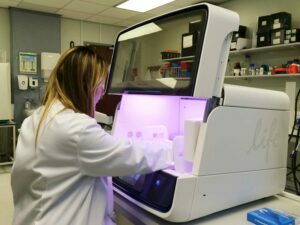 Through our collaborative relationship with the NHS All Wales Medical Genetics Service laboratory, we have access to the Illumina HiSeq and MiSeq technologies. With the NHS we are working to develop these modern DNA sequencing technologies for diagnosis of inherited disease, enabling more personalised and effective treatment. We are a team of experienced post-doctoral and technical staff with many years of sequencing and bioinformatics experience between us. We have the necessary expertise to take a sequencing project from initial sample to final analysis and specialise in providing a bespoke resource for our many research colleagues. We provide a bespoke sequencing service to biomedical researchers in medically important areas of genetic research such as cancer, inherited cardiovascular disease and neurological disorders that are priority health areas of the Welsh Government. We provide an invaluable source of expertise and advice to those wanting to exploit high- throughput sequencing. We work closely with our collaborators in the design and implementation of projects and offer bespoke bioinformatics support, working closely with investigators to ensure effective project design and full understanding and exploitation of their data. We are passionate in championing the role of high-throughput sequencing in modern biomedical research, working closely with research colleagues and encouraging adoption through workshops and seminars. Extensive genome, exome and deep targeted sequencing of tuberous sclerosis patient trios. mRNA sequencing of novel cell lines from human papillomavirus type-16 related vulval intraepithelial neoplasia. ChIP Seq on yeast samples subjected to induced DNA damaged. Examination of telomere fusion fragments using NGS. Variant analysis of clinically interesting trios subjected to exome sequencing on the Illumina HiSeq. Investigation of putative insertion sites in a mouse model. 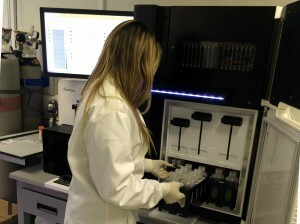 Working with our partners in the NHS, we have access to the latest sequencing technology to ensure the best possible platform is available for our collaborators’ needs. The latest arrival, capable of generating up to 1000 gigabases of data within a week or 300 gigabases within a few days using it’s rapid mode. A machine suitable for the larger project requiring the genome, exome or transcriptome sequencing sequencing of numerous samples. Capable of generating up to 15 gigabases of data within a couple of days. Suitable for analysis of gene panels and high depth gene sequencing. In addition, our bioinformatics team is supported by a dedicated high-performance six-node computer cluster, with 288 gigabytes of memory, 72 cores and 44 terabytes of hard drive storage, fully backed-up on a separate 50 terabyte back-up server to ensure data security. We provide colleagues with a complete pipeline for genomic scale DNA and RNA Sequence analysis. Our team will support your project from initial design through to grant applications, lab work, data generation, primary, secondary and tertiary analysis. We work collaboratively and flexibly with researchers to support research KPIs. Wales Gene Park is funded by Welsh Government through Health and Care Research Wales as an infrastructure support group. As such, we operate to recover consumable costs only. We work collaboratively with partners to meet the requirements of each project and deliver mutually beneficial outputs. We are located within the Sir Geraint Evans Building, on the Cardiff University Heath Campus.